The knives are firmly being sharpened for Liverpool manager Rafael Benitez at the moment with the English Premier League giants in the middle of a nightmare period both on and off the pitch. 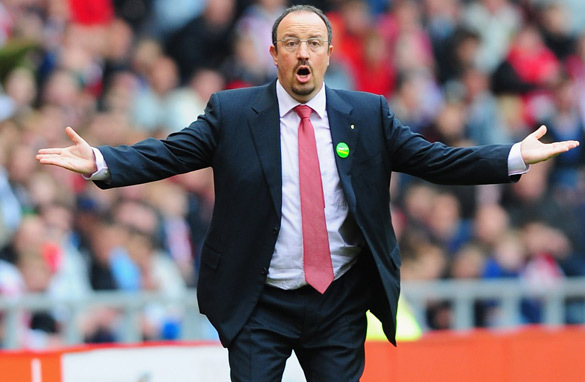 Rafael Benitez has looked an increasingly desperate figure on the touchline this season. Liverpool go into Sunday’s home clash against Manchester United in their worse run since 1987 – and four defeats in a row could easily become five should the Reds lose to their bitter rivals, a scenario not witnessed at Anfield for 56 years. The glory days of that remarkable Champions League triumph in 2005 seem a distance away for Benitez and the Spaniard’s body language has become more and more agitated and irritable as a crippling injury list, loss of form from experienced players and new-found defensive uncertainty have all combined to give Liverpool a distinctly fragile appearance in recent weeks. Suddenly every aspect of the club is being scrutinized, from the continued boardroom travails involving unpopular American owners Tom Hicks and George Gillett to Benitez’s transfer policy which has seen him sign over 70 players since taking charge of the club five years ago. Benitez has moaned about his squad size in recent weeks but, from where I am looking, the Liverpool squad appears as big, if not bigger, than most of their rivals’ squads. Size is not the issue, quality is, and it is my firm belief that Benitez only has himself to blame for the current mess his club are in. The accusation that Liverpool rely too heavily on superstars Fernando Torres and Steven Gerrard is true, but it is nonsense to say they are the only class players at Benitez’s disposal. The likes of Yossi Benayoun, Javier Mascherano, Albert Reira, Daniel Agger, Jamie Carragher, Glen Johnson and Pepe Reina are all top quality, but the truth is the second tier of players are simply not good enough. Who scores the goals when Torres is absent?...David Ngog?..Andrei Voronin?...How the Liverpool faithful must yearn for Robbie Keane, Peter Crouch or Emile Heskey, all experienced Premier League strikers jettisoned by Benitez. Who provides the creativity in midfield following the sale of Xabi Alonso?...Lucas? or will the still injured Alberto Aquilani provide the spark so sadly lacking when he eventually makes his debut? And who plays in the full-back positions?..Glen Johnson?, Fabio Aurelio?, Philip Degen? Andrea Dossena? Martin Kelly? Emiliano Insua? Jamie Carragher?...How many full-backs does a club need? Is Benitez’s job safe?...For the moment he won’t be going, especially as the ink on a lucrative recent five-year contract is barely dry.. But if Liverpool fail to finish in the top four, don’t expect the dour Spaniard to be at the helm next season, and, you know what, he’ll only have himself to blame. The Price of racism. Even those who were once friends now look like butchers. Adios Benitez! Sorry state for the Liverpool players and faithful. A combination of wrong tactics and bad boardoom politics cooks up a scenario as this. The Liverpool team these days is whitebread without the crust – where are all the talented African and Latin American players who are dominating the Premiere league these days? Somebody has been making odd personnel decisions that are not based on football skill – the question is if the fault is Benitez' alone, given the Texan ownership. George Gillett and Tom Hicks are the ones to blame and most Liverpool supporters agree. The guy from Uganda is not a supporter and does not speak for most of us. Seems to be a lot of talk about Rafa losing his job, most being from Chelseav (JT), Mancs & blue fans. Clearly Rafa frightens them and this is their best opportunity to dent LFCs future. Take 173 million out of any 1st team and see how it performs. Judge the manager when his squad is fit. Let's face it, the team was fit before the pointless internationals England & Spain played, yet we still suffered pointless injuries to Torres & Gerrard. As for squad strength, how can we expect to have a strong squad with only 20M to spend each summer, get realistic and let's get behind Rafa. I wouldn't necessarily blame Benitez for Liverpool's woes. The real blame should go to owners. Hicks and Gillett had no idea what they were getting into when they bought Liverpool. Now the club is in a huge amount of debt and no one is certain as to what's going to happen to the club in the future. Both are too stubborn to sell the club to someone who actually understands the sport.